It snowed again in Tokyo last night. Light at first but by evening it was coming down heavily. It was clearly time to get off the roads, get home and put a movie on. Sitting inside, my living room faces the street and we can always hear the cars as they pass by. As it was now icing up as well, we heard less and less as the evening went on. Then from outside came the "bang!" A loud sudden noise. Something had hit hard. I'd always feared a car crash on our corner. There were screams and then lots of shouting. All in Japanese but to the effect of "what the ****", "what did you do!" and "stop, stop". By this time there were more and more shouts and screams adding to the chaos and I ran down to see if anyone was hurt and if I could help. Opening my front door and expecting to see a wrecked car I came across a party of revellers returning from a wedding and clearly a little happier for their afternoon. They were having a huge snowball fight and massively enjoying themselves. What I'd heard was the first snowball landing squarely on someone's umbrella and the unfortunate owner screaming to find the culprit. They happily chased each other off down the street and you really have to smile and think, a snowball fight is pretty much the same wherever you are in the world. 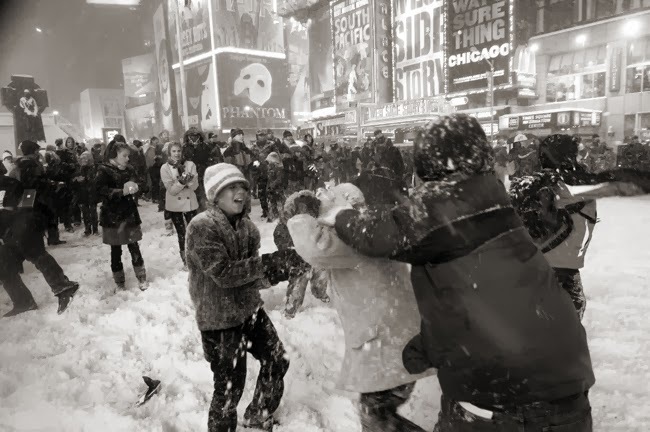 Thanks to whoever took this picture and I hope you all enjoy your snowball fights wherever you are.